Would you fly from San Francisco to Paris if your airplane was flown by a pilot that didn’t know what he was doing? Would you take your car to a mechanic who was just practicing in his spare time? Well, why would you trust your manuscript to the eyes of your computer’s spell check? Or worse yet…just anybody. Spell check has its advantages…fact or fiction? Most writers can use a dispassionate, sympathetic, yet ruthless reader who can point out everything that needs attention. We all know it’s a fact. Fixing commonly misspelled words is a big help. But, on the grand scale of things spell check might not be that reliable. How many times have you picked up a book or article and found at least one mistake? And the author probably used spell check. Even the best editors in the business are human. That’s where one more set of eyes comes in to your advantage. Most writers can use a dispassionate, sympathetic, yet ruthless reader who can point out everything that needs attention. A good editor will offer advice on proper formatting and spacing, while systematically helping your piece to flow better. 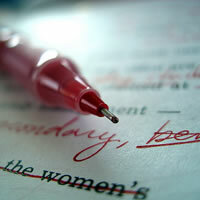 Some authors might think editing is just re-reading your work, therefore not really necessary. As a published author, I know what reading and re-reading is like. Our brains know what we meant to say or what our intention was. Therefore, when you read your own work you tend to skip over the mistakes as if they don’t even exist. That’s why you need to hire a reputable, professional editor. Understanding what you are going through, yet wanting the best piece in the end he or she will take you through the complete process. Publishers not only want books that are ready for print and devoid of as many errors as possible, but will overlook great works that come with too many mistakes. Stay Tuned! Friday’s post will be Part Two…How to Find the Right Editor for Your Book. 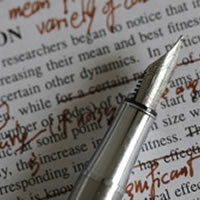 Have you hired a professional Editor? Share your experience! This entry was written by Wendy VanHatten, and posted on Wednesday, February 3rd, 2010. I interviewed a few people in the film industry for my website. All of the people offered me their assistance. I asked one of the script consultants to read one of my short films. Voila! My short film was critiqued three times in exchange for another interview. The information provided to me is invaluable and more helpful than any book I read. Travel writers can do the same with editors. Interview an editor in exchange for a review of your article or manuscript. Note: he or she may not review your entire manuscript, just the first 10-50 pages. It’s better than nothing!